This December join us at the Tett Centre for Creativity + Learning for an evening of creativity, conversation, connection and community. 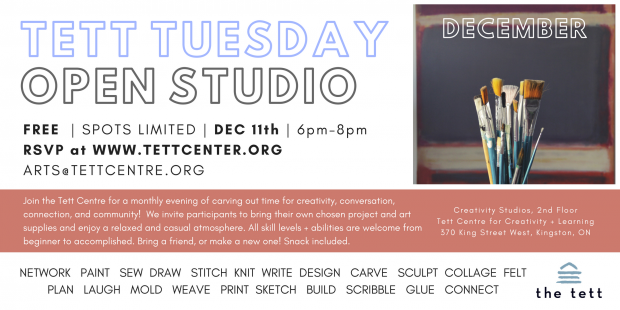 Tett Tuesdays is an opportunity to carve out time for monthly art-making, while working alongside, and getting to know aspiring, emerging, and professional artists and artisans in the Kingston community. We invite participants to bring their own chosen project and art materials and enjoy a relaxed and casual atmosphere. We encourage you to explore your creative-side! We hope you will build connections, be inspired, and try new things. Come with an open mind, bring your ideas, and get creative at the Tett!